Shorts + Gravity = Deadly Combination! Found in @PFTompkins twitter feed! "These stupid shorts are affecting my ability to navigate shallow staircases!" Thanks Paul and Thanks Mr. Tompkins! The Smorgasbord of Safety! You know it's impossible to resist touching the Hot Parts. And I want to be at the club where that awesome looking DJ is playing. I'll give it "steep", but it's not that far of a drop...I could climb back out of that thing. Just sayin'. Gives a whole new meaning to the word "breakdance." Is the bathing suit half full or half empty? Love the detailed artistic nature of this one! Thanks Cherie! I prefer to "mind" the gap. Wait, with that capital G, do they actually mean the store?? Are there so many immigrants coming from such 4th world countries that they don't know about escalators and need detailed instructions? Personally, I like the guy with the shopping cart for a hat. Jay and I both want to know: how do you trip over a hole? 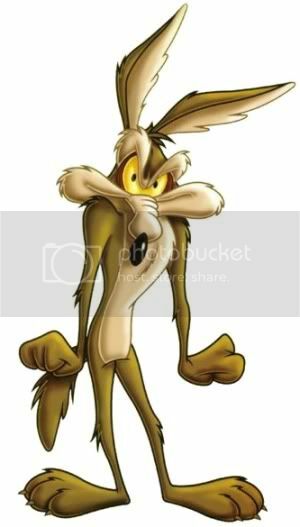 I guess only Wile E. Coyote knows...and he's not telling. This is the spot to do your bellyflops. Every other spot is unsafe. Or this is where the zombie lemmings go. Thanks to Robbie S. who sent this in via the SGF Facebook Fan Page. Yes, Cliffs, take care. Falling objects can wreck your profile. So, doing the Charleston will help you avoid tripping? Big thanks to Darrel & Claire's safety graphic adventures! Hard hats are not going to help when aliens fall from the sky. Put a roof over that thing! How about virgins? Can we throw virgins in? Walking up the stairs: Ur doing it rly wrong, akshully. Thanks for the picture, Madeline S via Noreen M! You think that guy is stiff now, wait till tomorrow. Man in triangle trips over a triangle. Thanks to Madeline S who sent in this picture taken by her friend Noreen M! The bike peeing on you as you go down really adds insult to injury.